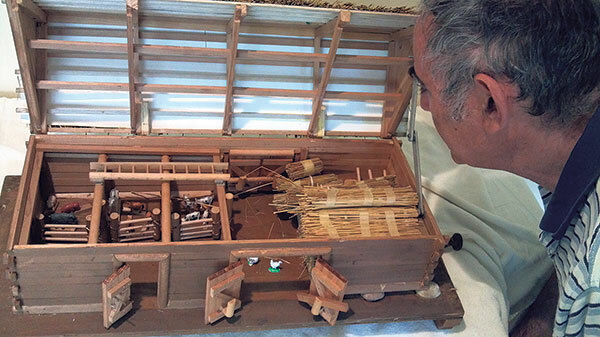 Leo Horowitz takes a close look at the model barn created by his father, Kalman. Intricate details include a stored ladder and a hiding place and escape hatch in the floor, top right. Kalman Horowitz spent the years 1939-1945 either confined or on the run — constantly seeking refuge, but never, except for brief periods, finding it. At one point, during the dead of winter, he and another Jew, also in his 20s, managed a daring, dangerous escape, leaping from a train headed for Treblinka. Horowitz’s companion Beryl led him through snow and cold to a Polish farmer whom he considered a friend. At first, the farmer allowed them to stay in his barn, but after a few months murdered Beryl. Kalman narrowly missed the same fate. Kalman’s story was told by his son Leo in a book bearing the ironic title Refuge, which is now in the Yad Vashem library in Jerusalem. The book, originally published in 2006 and reissued in 2015, soon will be joined by the model of a barn Kalman constructed following his retirement. 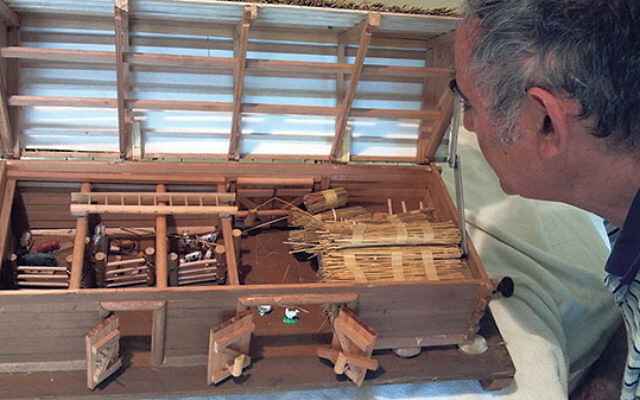 Crafted from memory and meant to represent different barns in which the elder Horowitz hid, the model features a lift-up roof and a detailed interior. Writing the book was an exciting departure for Leo, who has a PhD from Hoboken’s Stevens Institute of Technology and works in laser research. “From the time I was five, I remember my father telling stories of his past — in both Yiddish and English. Most of what I did was to record them on paper. I was fortunate that my dad was still alive when I was working on the manuscript in the late 1980s — he died in 2001 — and he offered some additions and corrections, as well as put the events in chronological order,” said the author. Kalman was 22 years old in 1939, when, having survived with his family the Nazi bombing of Warsaw, he was sent into forced labor. A year later, he was imprisoned at Majdanek concentration camp, but then sent back to Warsaw as the ghetto was being completed. Leaving his family behind, he fled, evading Poles as well as Nazis. For a while, he was actually employed by the SS. Escaping again, he was rounded up in a local ausseidlung (resettlement) and jammed with more than 100 others into a boxcar bound for Treblinka. This is where he and Beryl, along with many others, looped belts together to form a makeshift rope, which they used to dislodge iron bars from a small air hole high on the wall of the car. Then, climbing over each other, several made their way feet first to the outer wall of the moving train and leaped, even though they were being fired at by guards on top of forward and rear cars of the train, and in reckless disregard of breaking bones when they hit the ground. Following the betrayal by Beryl’s “friend,” Kalman spent the rest of the war hiding in the forest or any of a number of barns. Eventually, half-starved in a field, he was discovered by Russian troops.